A Fox News host is the mystery third client of US President Donald Trump's lawyer, a court has heard. A judge ruled that Michael Cohen, the president's personal attorney, must reveal the link to Sean Hannity. 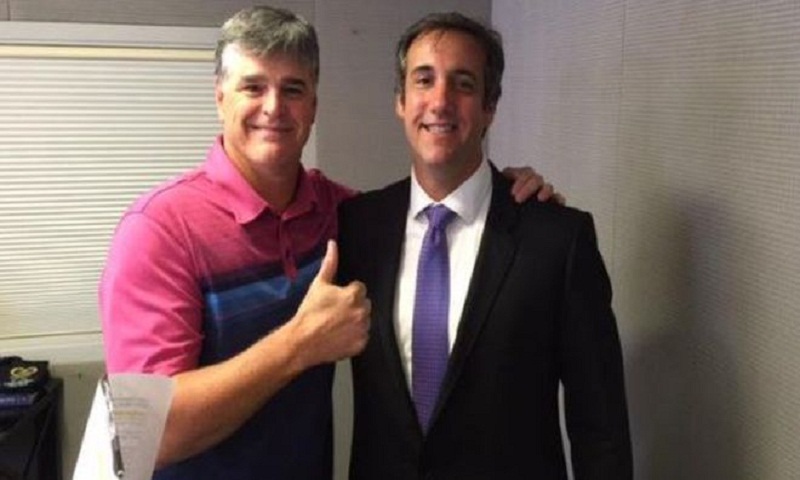 A vocal Trump advocate who has never previously divulged any legal ties to the president's attorney, Hannity denied he was a client of Mr Cohen. Monday's hearing in New York City follows an FBI raid this month on the presidential lawyer's home and office. Agents were seeking evidence on various matters, including a $130,000 (£90,000) payment made to adult film star Stormy Daniels. The judge also denied Mr Cohen's attempts to prevent prosecutors from reviewing the materials seized in the FBI raids. Mr Trump's attorney says the computers, phones and documents should be protected under attorney-client privilege. But Judge Kimba Wood ruled his application for a preliminary injunction was premature. It is not clear why Mr Hannity hired Mr Cohen. The conservative host, who is known for passionately defending Mr Trump on his Fox News show, issued a statement of denial. "Michael Cohen has never represented me in any matter," the Fox host said. "I have occasionally had brief discussions with him about legal questions about which I wanted his input and perspective. "I assumed those conversations were confidential, but to be absolutely clear they never involved any matter between me and a third party." He maintained it was no "big deal". But Judge Wood made one of the lawyers identify Mr Hannity on Monday. Mr Trump's attorney says he made the payment just before the 2016 election, but maintains Mr Trump did not know about it. The payoff to Ms Daniels could amount to a campaign finance violation, say legal analysts.